I could already tell from the way it was marketed, but it’s already obvious that The Boxtrolls, a likeable and funny film, will not do anywhere near as well as Laika’s previous films. While I can see there being life after Selick for the studio, what hooked people before was associations with Tim Burton and Neil Gaiman. What The Boxtrolls needed was the kind of concept that immediately hooks people in, like Wall-E or Happy Feet. They needed something that kept the dark edge but still seemed accessible. A grimy film about ugly trolls who live underground with a hermit crab-like relationship with cardboard boxes may have a lot of gems in the actual execution – and indeed it does – but I am completely sure that fewer people will give it a chance than it deserves. If they had marketed it with the human characters more to the fore, as the main point of identification and even with some cute factor highlighted, it could have attracted more of a crowd. But the trolls themselves were very much where the campaign centred, and that felt to me like trying to sell Frozen on those funny little rock troll things. They may have an important place in the plot, but they’re not what an audience identifies with. And that gets in the way of a cracking story full of very well-executed characters. It has a neat set-up that both gives us our hero and sets the antagonist’s actions into motion – though we have to assume the evil Mr Snatcher works extremely slowly for it to really work. 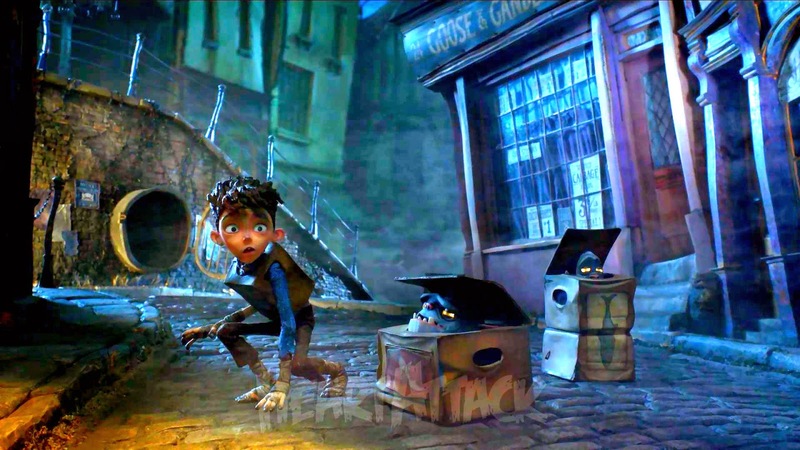 In the rather wonderful towering fantasy-English town of Cheesebridge, the curious little Boxtrolls live a nocturnal existence scavenging for bits of technology to put into their rather steampunk-ish lair. When a respected inventor vanishes and his son is taken by the Boxtrolls, the community begins to fear them – egged on by the nefarious Mr Snatcher, something of a tribute to Chitty Chitty Bang Bang’s child catcher, and voiced with as much evil camp as Ben Kingsley can muster. Snatcher is the most dangerous kind of social climber, desperate to join the elite of Cheesebridge, who wear white hats and mingle to discuss governing the town over all the finest cheeses – and he will do anything for this goal. He is aided by three henchmen who are rather brilliantly rendered – one is utterly unhinged, but the other two, played by Nick Frost (for once having a larger role in a film than Simon Pegg) and Richard Ayoade (star of The IT Crowd), wrestle throughout the film with questions of morality and the ever-dwindling chance that they are in fact the good guys. The child taken by the Boxtrolls, however, was not snatched away. He was given willingly by his father (Pegg), who was attacked by Snatcher, demanding he invent a killing machine. Adopted by the Boxtrolls, he grows up believing he is one of them, even getting a name like theirs, based on what is on his box – ‘Eggs’. Eggs is joined by the likes of ‘Fish’, ‘Shoe’ and, indeed, ‘Fragile’. When he is somewhat grown but Snatcher has succeeded in capturing almost all the Boxtrolls, he has a chance encounter with Winifred, daughter of the highest-ranking official in town. Winnie (Elle Fanning, spirited as ever) has something of a fixation on blood and gore, a character quirk that sits just on the right side of contrived, and resents how her father is much more interested in cheese than in her. Together, they put together a plan to rescue Eggs’ adoptive family – but ultimately it is Snatcher’s own plan reaching fruition and then finally him getting everything he ever wanted that proves his undoing. Some of the scenes here are the funniest in any animated film I’ve seen in a very long while. Eggs trying to pass in high society is just the right balance of embarrassing, disgusting, adorable and humbling. I loved the henchmen’s banter, and while I don’t usually like that kind of humour, I enjoyed the closing stinger of Ayoade’s character musing about his existence. Snatcher was animated with such grotesque relish, and I very much enjoyed the steampunk elements. Laika also seem to be the only American animation studio alongside Dreamworks-in-serious-mode who seem to be able to get adolescent characters right these days: Eggs and Winnie are not only a very enjoyable odd couple, they are both very sympathetic in their own right, and Eggs in particular I found extremely cute – helped by a natural sort of performance with an estuary twang from Isaac Hempstead-Wright, better-known as Bran from Game of Thrones. For a film animated in Portland, this was a remarkably British sort of a film, from its setting to its cast, and with that comes something of an appreciation for the dirty and grimy, as well as a celebration of quiet, unassuming hard work and a dislike of those who pull others down to advance themselves. That this also has a neat story with likeable characters attached to it, as well as some really stunning visuals and incredibly smooth stop-motion, and you have a highly enjoyable film. But I can’t help but feel it just wasn’t the film Laika needed just yet: they needed a couple more to really make themselves a household name with more obvious ideas first, and then this could be a follow-up.